The doyenne of American manners, Emily Post, released her first etiquette manual during the era of Prohibition. People were drinking and throwing parties, legal or not (she really thought it should be legal, by the way), and Post wrote the book on how to be a proper host. 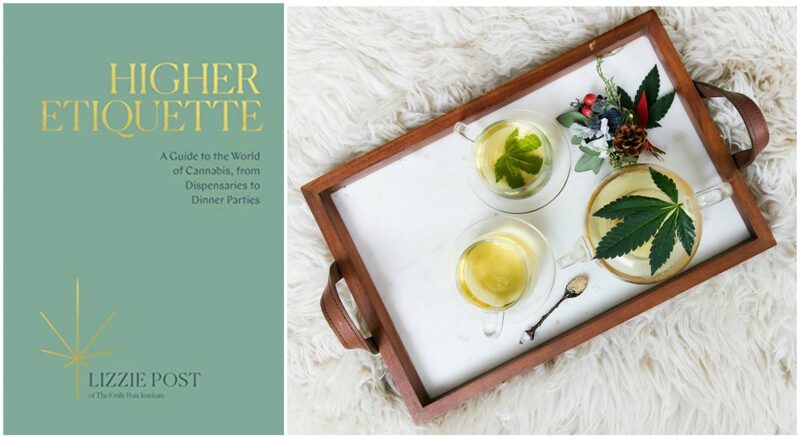 Now, her great-great-granddaughter Lizzie–who continues in her work of encouraging us all to act more civil towards one another through the Emily Post Institute–thought the time was right to discuss the manners and mores of cannabis culture. In Higher Etiquette, the younger Post explains how the core concepts of etiquette–consideration, respect, and honesty–apply specifically to sharing and using (or not using!) cannabis socially in the modern age. And yes, it is perfectly fine to bring weed to a dinner party. The original Emily Post was outspoken in her opposition to the prohibition of alcohol. Do you think she would see a parallel to current regulation of marijuana? She was really opposed to prohibition because she saw it as the government stepping in on what she saw as a private citizen’s rights. She fought pretty hard about that. That made me feel like she would be supportive of this. I don’t have any proof, but my guess is she would think of it as a citizen’s right. If you’re at a gathering where other people are using cannabis and you don’t want to participate, what’s the best way to decline gracefully? People really worry about “harshing the vibe,” but it’s not really like that. The easiest phrase to say is just “I’m good” or “I’m all set, thanks.” It’s worked for me every time I’ve ever used it. It’s really, really easy. You never need to feel nervous or uncomfortable about saying you have a boundary. I also encourage guests coming to my house to tell me if for any reason they don’t want smoking to be part of an evening, and that can be communicated from the outset. Should you tell your guests up front that your home or party is a cannabis-friendly zone? I think it can help. It’s important to know your audience. When my friends come to my house, I warn them when it’s not going to be a cannabis party, because they’re pretty used to that being something that happens at my house. And I think it’s nice to invite people to bring some. It’s totally fine to tell people, “Bring whatever strains you like, we’re going to have a lot of consumption tonight!” It’s important for any good host to communicate. One of the ways that cannabis use becomes more normal is when we talk openly about it and share. And if you’re going to visit a friend who enjoys cannabis, it’s totally polite to bring some as a hostess gift! You do need to take some responsibility for confirming that everyone has a safe ride home at the end of the night. I do think that is a really courteous thing for a host to do. It’s something that is courteous for people who consume alcohol as well, which we don’t talk about very often. If you’re going to smoke something, how can you be considerate of other people in the house? It does impact other people around you! You want everyone’s buy-in. If I have friends over and some of them don’t like to be around smoke, even as the host, at my own house, I would offer to go outside with the people who do want to smoke. I don’t want someone to feel bothered by the second hand smoke–and it is second-hand smoke! Vapor and vape pens are enticing options for a lot of people because the smoke clears quickly and doesn’t smell as strong, but even then, if you’ve been asked not to, don’t disrespect someone’s home. Step outside if you’re going to do that. Let’s say you can smell your neighbors smoke and don’t like it. What’s the best way to address the situation? The first thing I would do is look to see if there is a way to block it, just as I would want to block any odor coming in from a neighbor or outside. But, ultimately, if what they’re doing is legal, it’s fine to let them know that the smoke is bothering you, but there’s also an extent to which people are allowed to enjoy what they’re enjoying in their own house. It’s similar to how we would approach noise. There’s a point at which you want to speak up, but you also want to try to find a way to compromise with that kid who just got a drum set and wants to practice.